I started with the chimichurri so that all the flavors could blend together while I prep the steak. I used half a bunch of cilantro, some chives, garlic, lime zest, salt, Aleppo Pepper and olive oil. 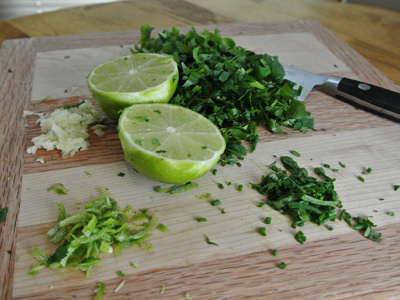 Chop the cilantro, chives, garlic fine and zest the lime. Add it all together in a small bowl, sprinkle with a pinch of salt. Drizzle with olive oil until the herbs are saturated. I have 2 skirt steaks approximately 1 1/2 pounds. I seasoned them with a little salt and pepper. Spread the chimichurri across the steak. 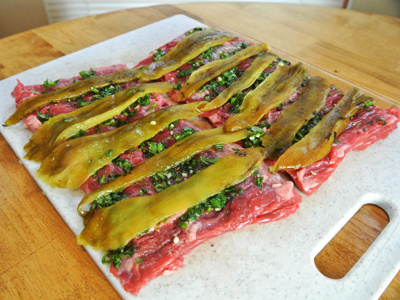 Add strips of green chile over the chimichurri. Add sliced Manchego cheese on top. 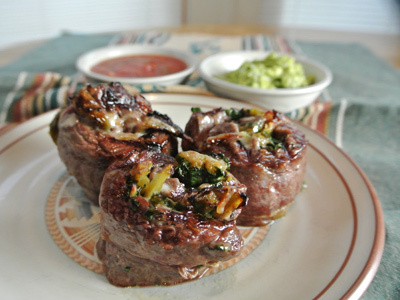 Roll the steak and tie together with twine. 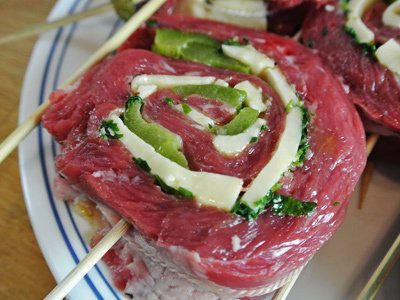 Then make thick sliced pinwheels. I cut 3 pinwheels from each rolled up steak. Start the grill going nice and hot. Skewer the steak. If using wooden skewers, let them soak in water for 20 minutes prior. When the temp reaches 400 degrees, set the pinwheels on for 5 minutes, then turn them over and sear the other side for another 5 – 6 minutes. Serve guacamole with roasted corn and salsa on the side. 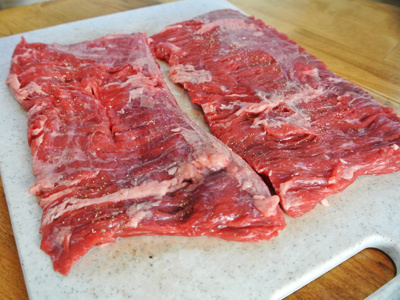 Trim skirt steak of any excess fat. 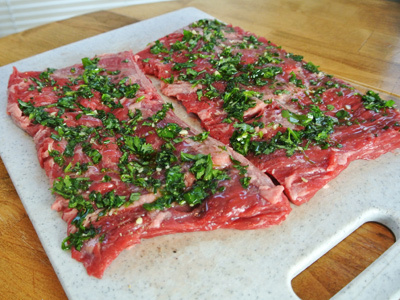 Lay flat on a cutting board and sprinkle with salt and pepper. 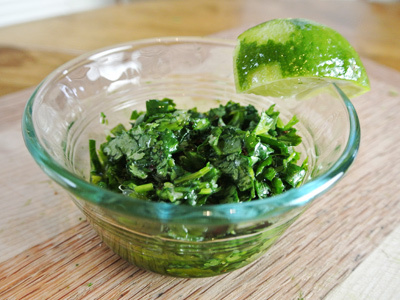 Spoon or brush cilantro chimichurri over the steak. 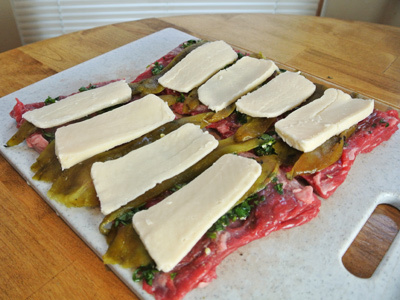 Lay strips of green chile over the chimichurri and then top with cheese slices. 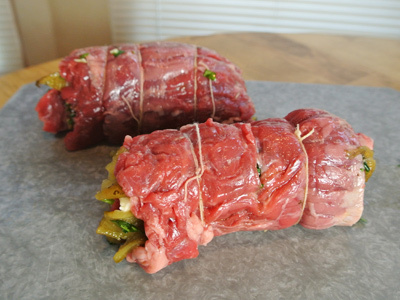 Gently roll the steak, tucking in the filling as you go and tie together with twine. Skewer steak and slice thick approximately 1 1/2 – 2 inches thick. 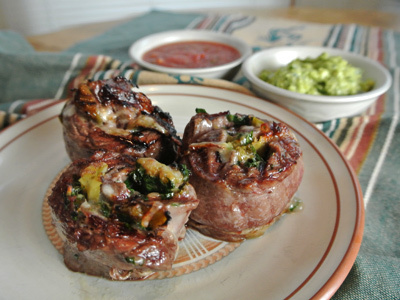 When the temp reaches 400 degrees grill pinwheels 5 minutes, then turn over and cook an additional 5 – 6 minutes. 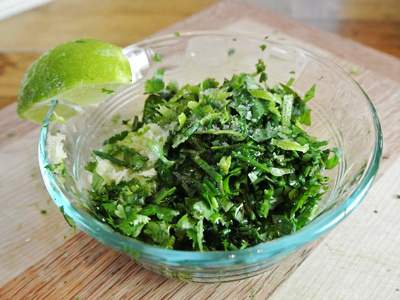 Mix together herbs, garlic, lime zest and salt. 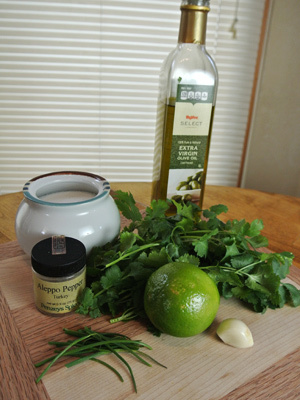 Drizzle olive oil over herbs until they are completely saturated.